GAUSS Srl is participating in the Castelgrande Observatory Mission, through the CastelGAUSS Project, providing technical assistance and its know-how in space debris research. 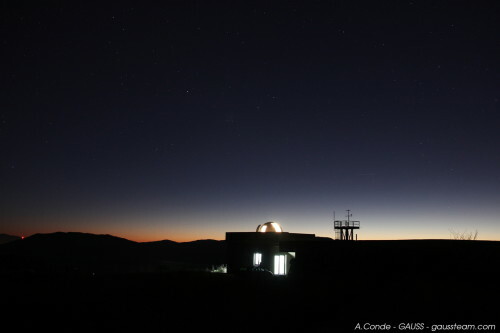 Being the area of Toppo di Castelgrande – in the Italian region of Basilicata – particularly suitable for space objects observation, it already hosted the astronomical observatory run by INAF-Capodimonte, with a 1.54 meter altazimuth telescope (TT1). 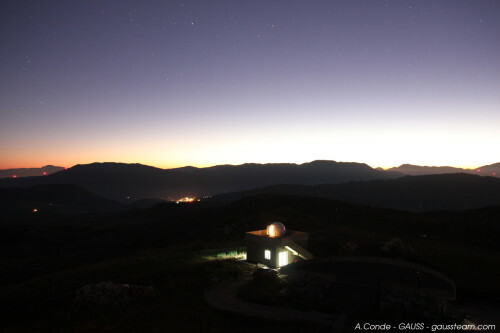 Near the above-mentioned observatory, a new building dedicated to the detection of space debris and asteroids has been added by the local authorities, CastelGauss Observatory, run by KIAM and GAUSS, containing automatised telescopes for the optical observation. 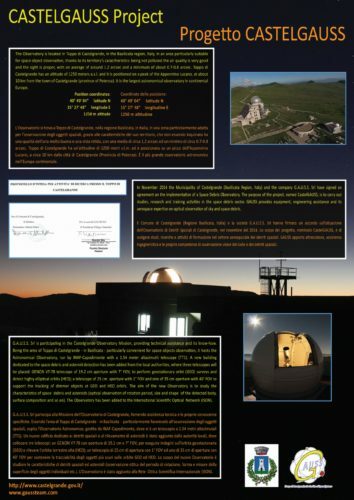 Castelgrande Observatory forms part of the ISON (International Scientific Optical Network), managed by Dr. Igor Molotov of the KIAM Keldysh Institute of Applied Mathematics – Russian Academy of Sciences, Russian Federation. 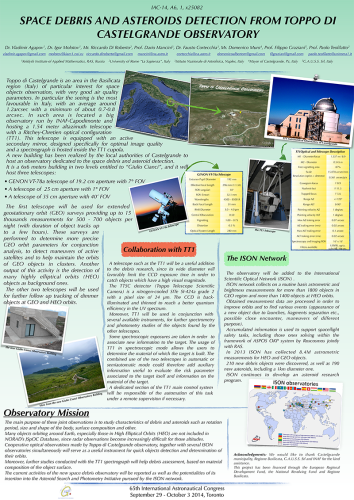 The International Scientific Optical Network is an international project carrying on the activities of detection, monitoring and tracking of objects in Space which has placed about 30 telescopes in several observatories in 11 different Countries (Russia, Ukraine, Georgia, Uzbekistan, Tajikistan, Moldova, Spain, Switzerland, Bolivia, USA, Italy). 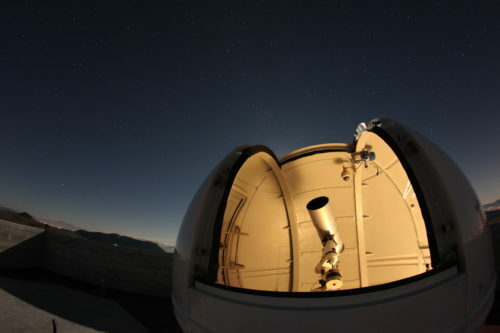 As in the case of CastelGauss Project, ISON Space surveillance system is conducted in collaboration with specialized teams located in the several observatories around the world, having a good astro-climate and operating optical telescopes. 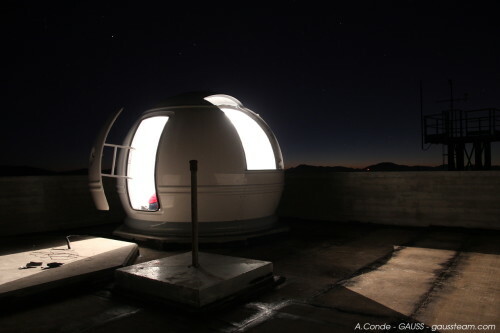 ISON specialists, experienced in optical telescope production and technology (including software) can train astronomers and donate telescopes, like the one in the facility of CastelGauss Observatory. KIAM Institute coordinates the ISON project and analyses measurement data that can be used to support spaceflight safety, improve orbits, detect the appearance of new celestial objects, the possibility of close encounters and so on. 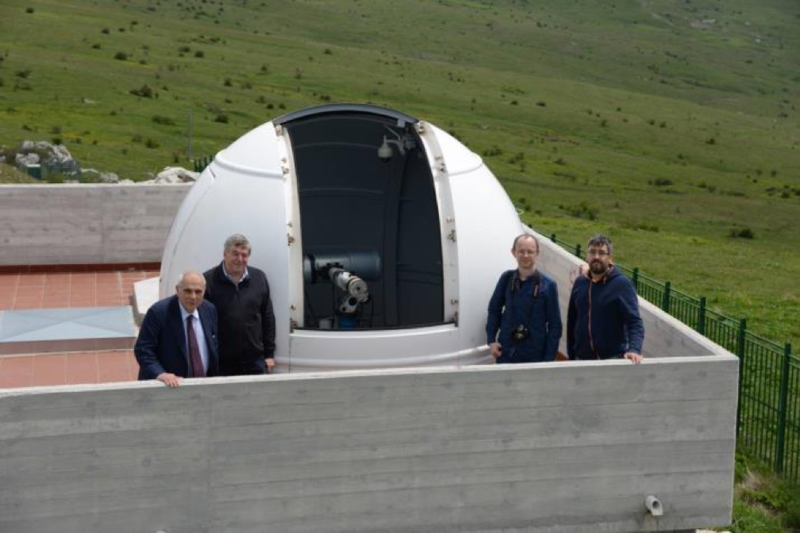 From left to right: Professor Filippo Graziani (GAUSS President) with Prof. Paolo Teofilatto (Current Dean of the School of Aerospace Engineering), KIAM Astronomer Sergei Schmalz and GAUSS Engineer Marco Truglio at Castelgrande Dome, where the ISON telescope is located. The aim of the new Observatory is to study the characteristics of space debris and NEOs (including asteroids), the optical observation of rotation period, size and shape of the detected body, photometric measurements, surface composition and so on. Inside the Dome, there is a 22-cm aperture ORI-22 telescope (with 4.1×4.1° FOV, 510mm focal length and 4.82 arcsec/px scale) installed on a Skywatcher EQ-6 Pro mount and equipped with a 3k×3k FLI CCD camera. A second telescope will be installed in the near future: a 35-cm aperture Ritchey-Chrétien telescope with 40′ FOV to support the tracking of dimmer objects at GEO and HEO orbits. The astronomical Observatory has been assigned an MPC code (L28) from the Minor Planet Center. 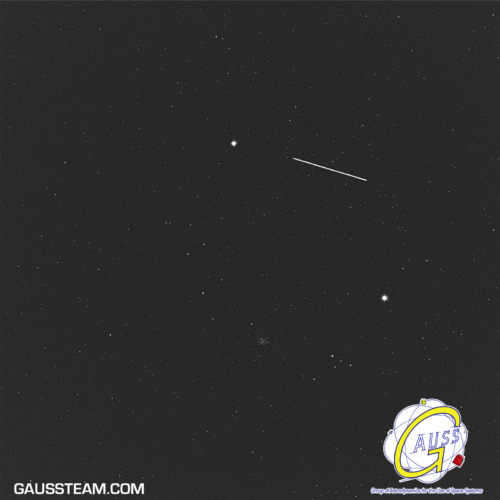 From the Observatory GAUSS personnel has been able to capture a picture of the Chinese Space Station Tiangong-1 while passing over Italy during its descent to re-enter the Earth atmosphere, on March 31, 2018. The vivid photo has been taken during the activity of observation and monitoring with an exposure of 0.5 seconds, and the IFOV is located at 18h 36m 48.602s RA, -23˚ 09′ 15.96″ DEC. 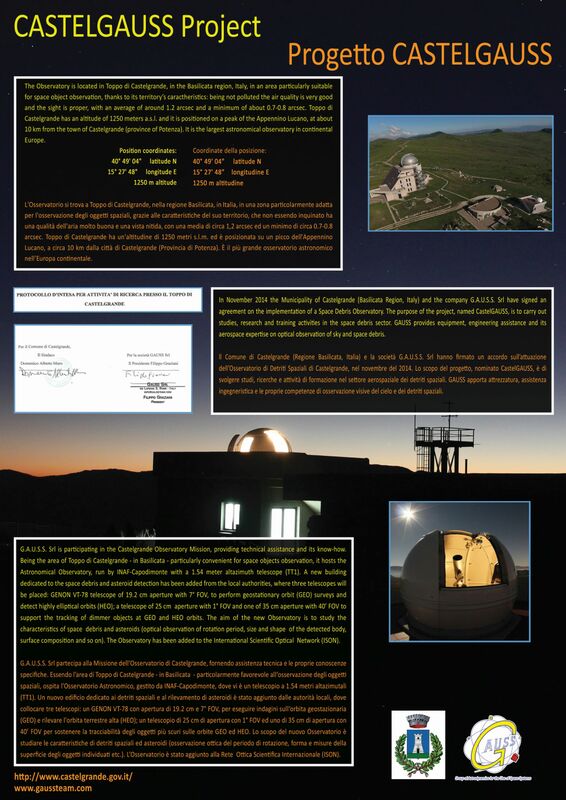 Here below you may find some pictures of the Observatory, together with some results of photometric measurements realized. The results of the space debris observation are being further studied.